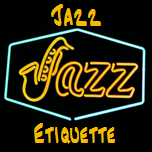 Jazz Etiquette is an exploration of the often bewildering imperatives that guide the behavior of the jazz player, band leader, club owner, and artistic recipient, AKA the audience. This series aims to help the jazz novice or even the jazz aficionado to more fully understand the creative life tension that is the jazz musician. We’ll shed a dimly lit candle on the interactions between those who have embraced endless practicing of their musical craft for the opportunity to play late at night in smoky, poorly ventilated, venue for next to zero pay in front of a dedicatedly indifferent audience. The wisdom that is about to be imparted to you is drawn from the works of Stephen Howard, and his series of writings, Notes from a Small Workshop, Anecdotes and Musings from the Workbench. Stream episodes to your media player by clicking on this icon (256k). Right click to download.